More Than 200 People Dead From Cyclone Idai In Mozambique, Malawi, Zimbabwe The cyclone made landfall in Mozambique on Thursday and has destroyed roads, bridges and homes, leaving people stranded and displacing tens of thousands. People are seen emerging from a mist on Sunday in eastern Zimbabwe. Cyclone Idai barreled across Mozambique, Malawi and Zimbabwe with flash floods and ferocious winds, killing people and destroying homes. A powerful cyclone that tore through Mozambique, Malawi and Zimbabwe this past week has destroyed roads, bridges and homes and left more than 200 people dead and tens of thousands displaced across the affected region. 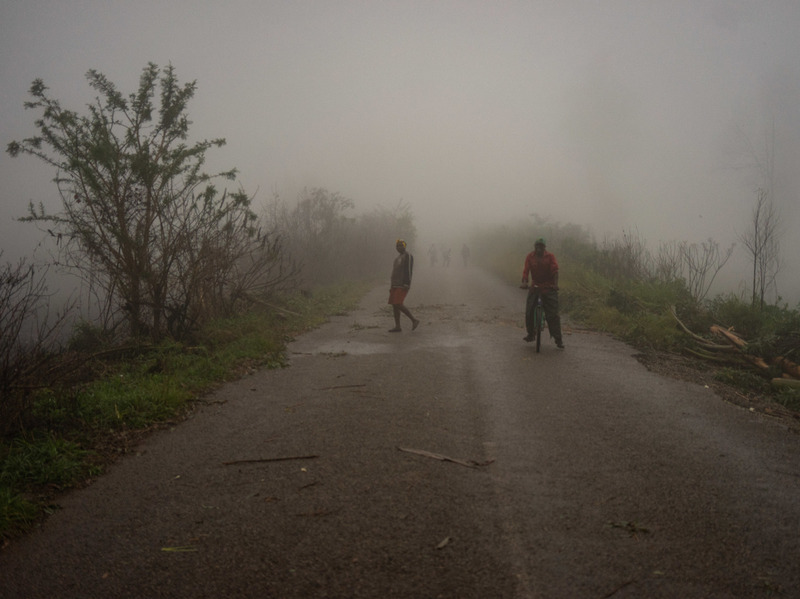 About 1.5 million people in total have been affected by Cyclone Idai's torrential rains and winds that have reached speeds of up to 200 kilometers, or 124 miles, per hour, according to the United Nations. The tropical cyclone made landfall Thursday near the coastal city of Beira, Mozambique, which lost electricity and communications in the storm. The cyclone weakened as it moved into eastern Zimbabwe, Ish Mafundikwa reports for NPR. Nonetheless, it remained powerful enough to wipe out infrastructure and homes, leaving many people stranded in inaccessible regions in the country's eastern highlands. The U.N. reported last week that 122 people had died in Mozambique and Malawi prior to Cyclone Ida's landfall as a result of flooding caused by the tropical cyclone's weather system. At least 48 more died after the storm made landfall, the U.N. said citing unverified media reports. Mozambique's President Filipe Nyusi said Monday that 84 had been confirmed dead in the country. Speaking on Radio Mocambique, Nyusi said that the scale of the disaster is "huge" and expressed fears that the death toll could rise to around 1,000. Joshua Sacco, a member of parliament in Zimbabwe, told local media that officials did not have an accurate count of the missing, indicating that death toll reports could increase. Pictures and video on social media showed roofs torn off buildings and extensive flooding strong enough to sweep along a large car. Some of the storm's effects could be felt as far inland as Harare, the nation's capital city, some 200 miles from the border. Zimbabwe's president, Emmerson Mnangagwa, declared a state of disaster in affected areas and shortened a visit to the United Arab Emirates, according to Zimbabwe's Ministry of Information. Karikoga Kutadzaushe, operations director for the Zimbabwe Red Cross, told the South African Broadcasting Corporation that the situation is "quite dire" in the country's eastern highlands. "The immediate needs for people is shelter ... because most people have been displaced," he said. "There is need for food. There is also need for medicals for those who have been injured." Two boarding school students were among those killed in eastern Zimbabwe, according to Kutadzaushe. He says they died after a boulder rolled into their dormitory. Many of those displaced are being housed temporarily at higher ground, including in schools and churches. One hotel in Chimanimani, a mountainous area near the eastern border that was hit particularly hard by the cyclone, is sheltering more than 300 people whose homes have been destroyed, an employee told Mafundikwa. Rescue efforts were hampered by flash floods and bridges that had been destroyed, Kutadzaushe says. By Sunday, the winds and rain had eased and visibility had improved, allowing Zimbabwe's air force to ferry some of the injured for medical care, the country's Ministry of Information reported. The full extent of the devastation is unclear but will include damage to crops, water supply destruction and increased risk of gender-based violence, according to the U.N.